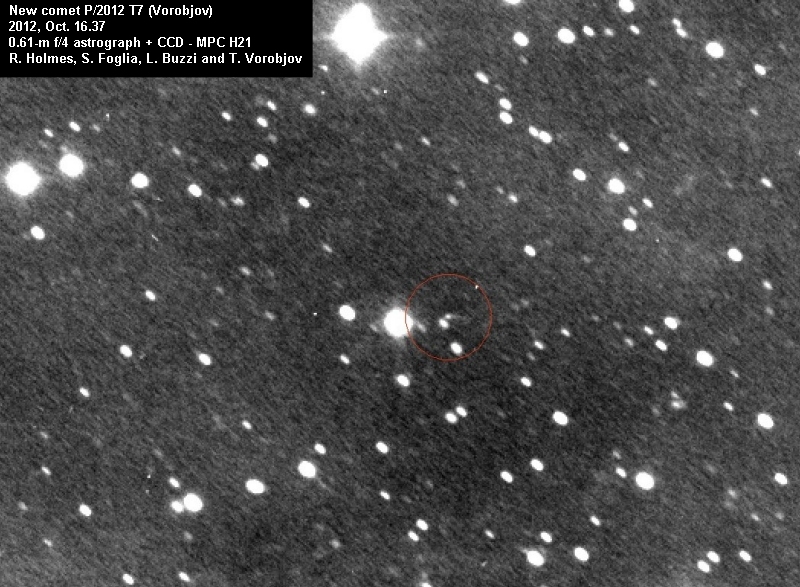 P/2012 T7 (Vorobjov) was discovered on 2012, Oct. 15.3 by Tomas Vorobjov from Bratislava, Slovak Republic, using remotely a 0.81-m f/7 Ritchey-Chretien reflector located at the Mt. Lemmon SkyCenter via the Sierra Stars Observatory Network, during a minor-planet search survey undertaken as part of the International Astronomical Search Collaboration (IASC) school campaigns, which I’m proud to be part of. Three 120 seconds images that he took with Alexander Kostin (Houston, TX, U.S.A.) revealed its cometary appearance, with a tail in PA 270°. 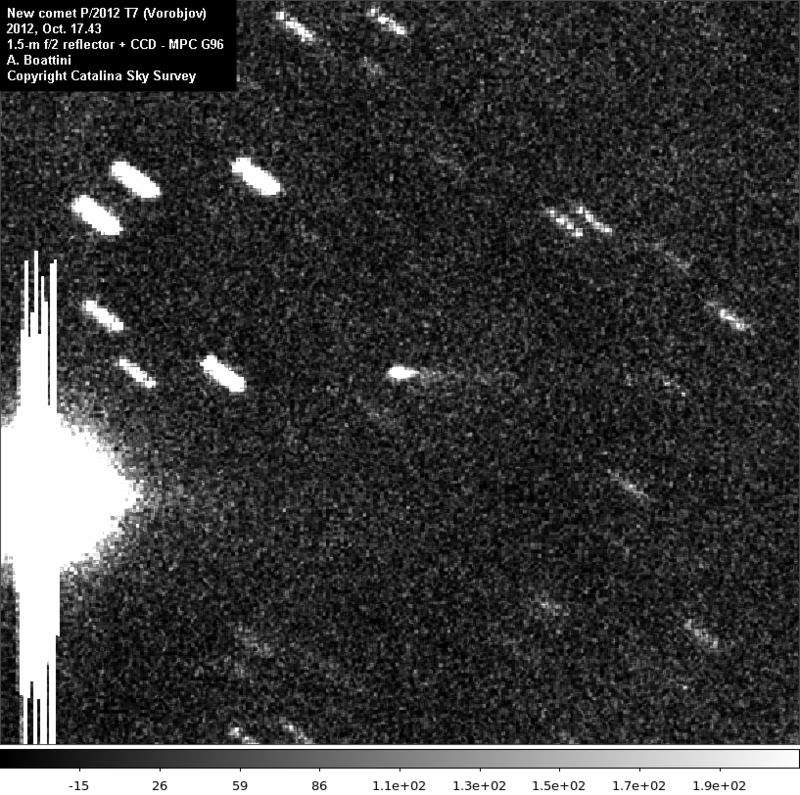 A confirmation set of images were taken by R. Holmes the following night with a 0.61-m f/4 astrograph from Westfield-H21, showing a 6″ coma and a tail 25″ long in PA 260°. 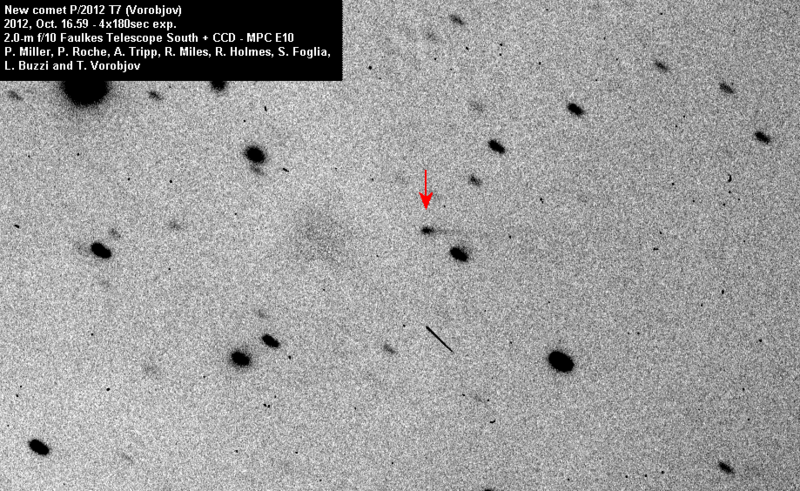 Due to its cometary appearance, it was posted on the NEO Confirmation Page under the temporary designation TOV7DD. I was able to image it under good seeing conditions but with passing high, thin clouds on Oct. 17. 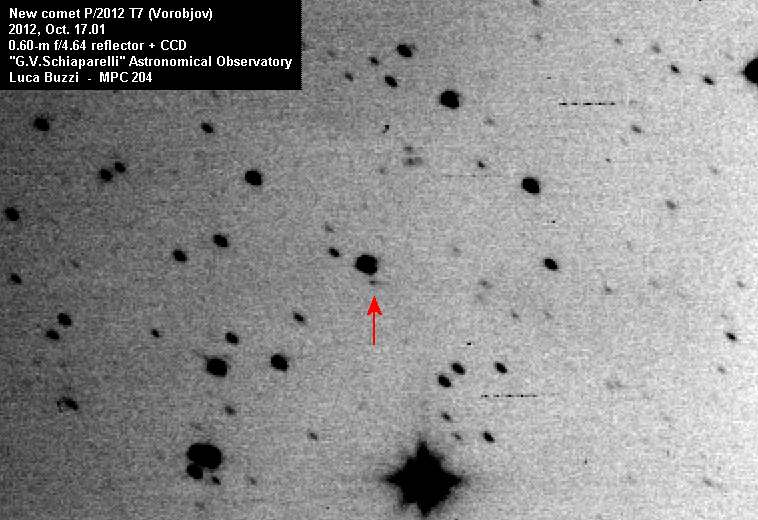 Several other observers then noted its features, including many from IASC and T3 project, and results were published in CBET 3260 (subscription required) and astrometry, together with elliptical orbital elements, in MPEC 2012-U40. Some images are visible below. Well done Tomas, let’s hope this is only the first of a long series!! !